Gosh, I’ve received so many greetings on my birthday that it’s overwhelming. From the bottom of my heart, thank you oh so much! We’re still canon! Have some lovely cuties saying thank you. 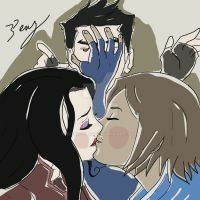 Korra: Asami would've helped with the sign, but she's tired. AndRyu: Really, what knocked her out? AndRyu: Korra, why did you answer my question with a question? Very crafty. Lol thank you dear! ^_^ how old are you now? It's still your birthday where I live for 6 more minutes, so, happy birthday! Can't remember if I said so or not so HAPPY BIRTHDAY!! !